For wide distribution and posting please. The home in Falmouth USA where these measurements were taken was also the subject of the injunction issued by Justice Muse in December 2013 to prevent irreparable harm" to physical and psychological health. 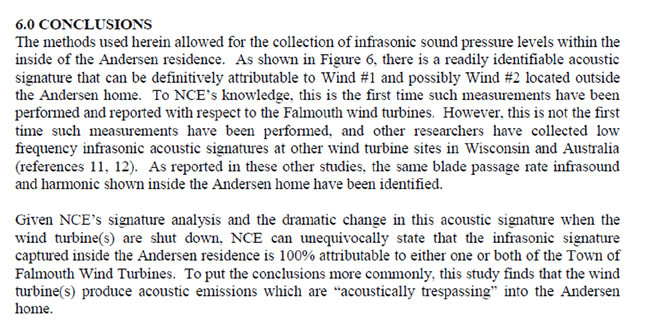 The attached acoustic report gives an idea of their exposures. Turbines create “waste energy” in the form of airborne pressure waves (sound) and ground-borne pressure waves (vibration). Noise is that part of the sound frequency spectrum which is audible, but “noise” is also defined by psychoacousticians as “unwanted sound”. The strength (sometimes expressed as a loudness in the case of noise) of the sound is measured in decibels (“dB”). The wavelength of individual sound waves is a measure of the distance between the peaks of the pressure waves. The speed of sound divided by the wavelength gives the frequency of the sound and is expressed in hertz (Hz). Where the frequency of the sound waves is below 20 Hz, the distance between the waves is relatively long, and the general term for this portion of the frequency spectrum is known as infrasound. Infrasound is only audible at very high levels (dB). However it can be damaging to the human body at levels well below audibility. Infrasound persists for much greater distances than audible sound and, unlike audible sound, penetrates well insulated building structures (including double glazing) with ease; and often increases the impact by resonating within the house, like a drum.iii iv This occurs, regardless of the source of sound & vibration energy. Penetration of buildings and amplification via resonance can also occur from sound and vibration from natural sources such as earthquakes and thunder. Standards for wind turbine noise pollution in Australia are set in audible decibels (“dBA”) outside houses.v Use of dBA excludes accurate measurement of frequencies below 200 Hz, including both infrasound (0 – 20 Hz) and low frequency noise (20 – 200 Hz). These Standards do not require infrasound (either within or outside homes) to be predicted in planning submissions nor to be measured in the required compliance testing to the planning permit noise conditions. Most jurisdictions do not require wind turbine generated low frequency noise to be predicted or measured either (unlike other sources of industrial noise). In fact most noise measuring instruments and microphones are unable to measure accurately in the infrasound range, especially below 8 Hz, and some Standards explicitly specify the use of equipment which cannot measure infrasound. 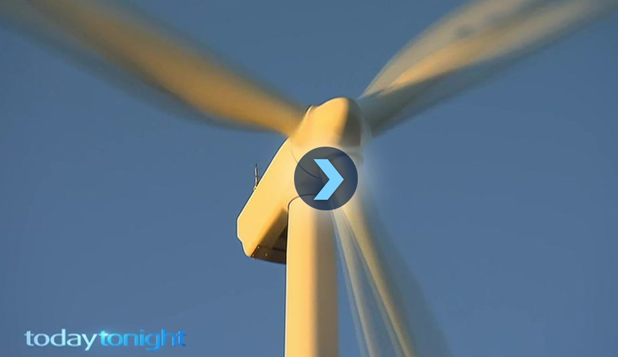 Wind turbines produce infrasound along with audible noise. The more powerful the wind turbine the greater the proportion of infrasound and low frequency noise emitted,vi which then increases significantly if the turbines are sited too close together, now common practice in Australia.vii Most newer wind turbines are now 3 MW or 3.5 MW, compared to 2MW at Cape Bridgewater. By the use of different sound meters and microphones, and in narrow (frequency) bands it is quite possible to identify and measure infrasound specifically from wind turbines, in the field. This unique “wind turbine signature” has now been demonstrated by the acoustic consultants involved in the Health Canada Studyviii and by Professor Colin Hansen’s team at Waterloo,ix in addition to Mr Cooper’s measurements at a number of locations in Australia prior to, and including, the Cape Bridgewater Acoustic Investigation. Wind power projects and other energy generating noise polluting industrial developments involve very large sums of money in construction, in revenues and in the case of industrial wind turbines - public subsidies. It is not uncommon to find companies with large investments and large cash flows going to great and improper lengths to maintain their cash flows. Une étude australienne établit la relation entre infrasons émis par les éoliennes et les troubles de santé ressentis par les riverains. La relation de cause à effet est confirmée : les infrasons émis par les éoliennes sont en relation directe avec les troubles et les sensations souvent insupportables perçus par les riverains. C’est ce que révèle une étude menée par l’ingénieur en acoustique australien, Steven Cooper, dans le parc éolien de Pacific Hydro à Cape Bridgewater (Etat de Victoria). Les résultats montrent la corrélation entre un patron d’infrasons, qu’il a baptisé « signature acoustique de l’éolienne » et l’apparition et la gravité des symptômes ressentis par les victimes. Troubles du sommeil, maux de tête, tachycardie, pressions dans la tête, dans les oreilles ou la poitrine… Il est avéré que les symptômes réunis sous le nom de syndrome éolien (SE) résultent des effets néfastes des infrasons mais aussi « des signaux discrets à basse fréquence modulés en amplitude » identifiés par l’acousticien comme étant d’autres facteurs perturbateurs. Le référentiel de mesure fait toute la différence pour détecter les infrasons. En effet, pour capter la « signature acoustique » de l’éolienne, il faut utiliser l’analyse de bande étroite, avec des résultats exprimés en dB (WTS). Les indices de mesure traditionnels tels que dB (A) ou dB (C) et les bandes d’un tiers d’octave ne sont absolument pas adaptés. De fait, toutes les normes actuelles qui réglementent les nuisances près de parcs éolienssont inappropriées puisqu’elles ne prennent pas en compte les infrasons. Les résultats de cette étude corroborent les études de Kelley**,publiées aux États-Unis il y a plus de 30 ans, montrant que les infrasons émis par les premiers modèles d’éoliennes, aux pales sous le vent, étaient à l’origine des troubles du sommeil et d’autres symptômes du SE***. Elles confirment enfin ce qu’un scientifique français, automaticien, Vladimir Gavreau, avait découvert dès les années 60. Ce précurseur avait en effet établi le lien existant entre les symptômes (lipothymies, migraines et nausées) survenus parmi les membres du personnel de son propre laboratoire et les infrasons émis par un ventilateur à cadence lente. L’étude Cooper donne raison à de nombreux docteurs et chercheurs qui par le monde ont tiré la sonnette d’alarme. Les autorités réglementaires ont bien voulu croire l’industrie éolienne quand elle affirmait que les nouveaux modèles n’émettaient pas d’infrasons dangereux. Elles ne peuvent plus ignorer leurs effets dorénavant. The following article was on the front page of the Australian newspaper, in prime position up the top. It is Australia's only national newspaper. Please circulate widely, repost the links, story and the resident's public statement. “In our view, the results presented in the report do not demonstrate a correlation that leads to the conclusion that there is a causal link between the existence of ­infrasound frequencies and the ‘sensations’ experienced by the residents.” Mr Cooper said the findings had totally discounted the so-called “necebo” effect put forward by some public health ­officials, who said symptoms were the result of concerns about the possibility of experiencing them. The determination of the actual physical parameters involved in the measurement, interpretation and assessment of wind farm noise (audible and infrasound) on persons is formalised and supported by extensive documentation. The development and determination of the concept of ‘sensation’ as distinct from ‘noise’ due to infrasound, low frequency sound, audible sound or vibration is ground-breaking and unique. The concept has an important place alongside standard measures such as ‘quality of life’ and psychoacoustical correlates. The obvious support from both PacificHydro and the residents is the stand-out feature of the study and it is clear from the text that the outcomes were not envisaged by yourself or the study participants at the commencement of the study. The approach taken is highly professional and supportive to both your client (PacificHydro) and sympathetic to the residents who provided you with their assistance. The determination of a wind turbine signature at two different frequency ‘sets’ related to sensation is unique. The sensation frequencies are grouped in the infrasound 1Hz to 5Hz and low frequency 30Hz to 35Hz bands for the Repower 88 turbines. Different turbines will have different centre frequencies and sidebands at the blade pass frequency. The methodologies for determining sensation are the link-points for many other studies that did not have the access to the acoustical data and human response questionnaires developed by you for this study. The determination of a wind turbine signature consisting of the nominal blade pass frequency and first 5 or 6 harmonics is a significant outcome from the study as these frequencies are present and measurable even in high winds. The study provides significant ‘food for thought’ for power station managers and regulators with respect to the anecdotal issues /questions / complaints of adverse health effects and sleep disturbance, annoyance and loss of amenity and wellbeing experienced by persons living near a wind farm. 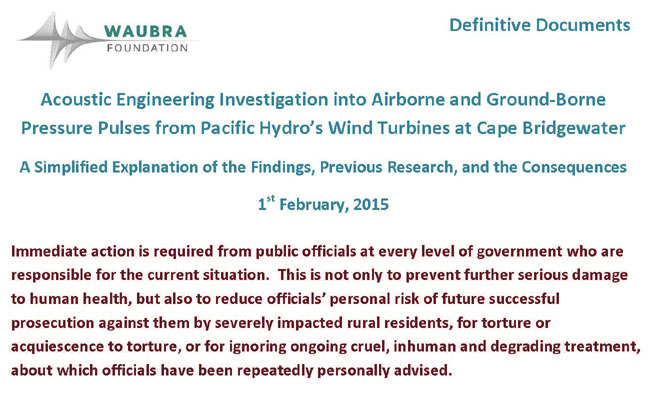 Can the operation of the wind farm be modified to reduce or mitigate the disturbances experienced by the residents? The present situation cannot continue without change. The report has raised hard questions for PacificHydro to discuss with the residents. It is to be hoped — and expected — that support is given for the next steps of resolving the issue of adverse effects and restoring individual amenity and wellbeing to its original status prior to the operation of the wind farm.